I've been dyyyyyying to share this post!! When planning for Baby Nichols 2.0's nursery, I KNEW that it had to have these two things in it. So, when it finally happened, I was ecstatic! 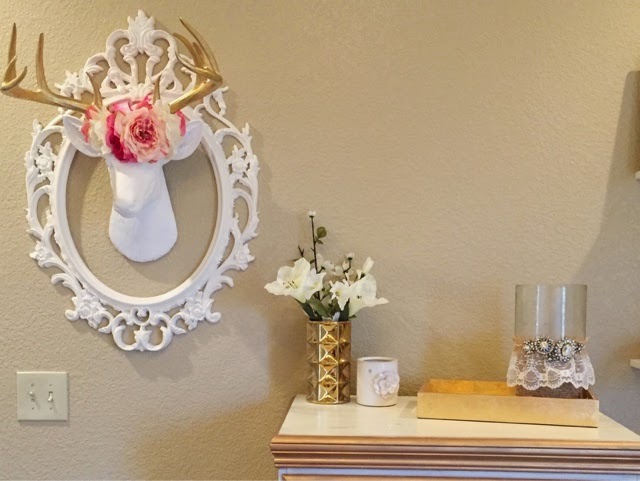 Faux taxidermy has quickly become popular for nurseries, kid's rooms, offices, and more and I wanted one with gold antlers to go with the color scheme of the nursery. The hunter-man in my husband was like, "really? a fake deer for a girl?" but whatever. It's adorable. We call him Alfred. 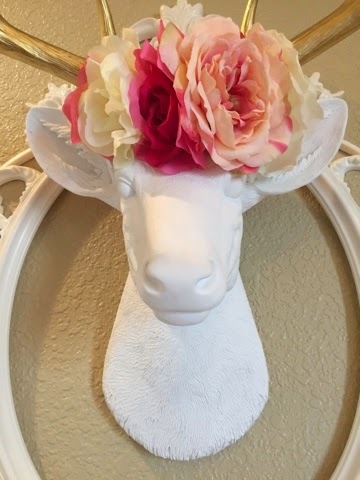 Alfred is from Near and Deer, a small shop that I am featuring for the nursery. 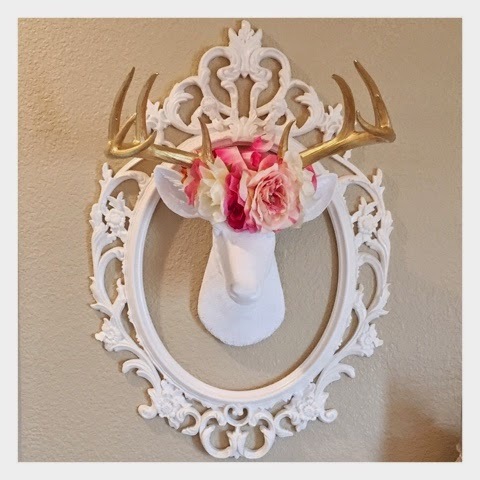 He is a 14-point faux deer head wall mount that is white with gold antlers. I easily hung him in the nursery with one dry wall hook, and he's been hanging there since, ever-so-lovely. Alfred is seriously one of my favorite parts of little girl's room. Each piece ordered from N&D is custom made. The options are endless and there are so many different styles that you can find to meet the needs for the decor of your room! The frame around the deer head can be found at IKEA. The gold vase is from Target (I got it 30% off!). White flower warmer is Scentsy. 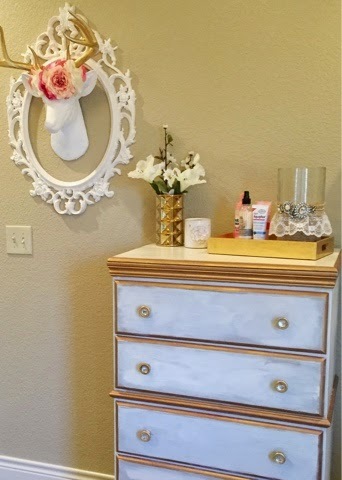 Gold tray is from At Home and the canister was DIY to hold sweet girl's headbands. Although Alfred is already gorgeous, he needed a little help to make him girly. In came The Golden Tot Shop. 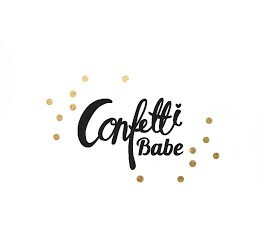 If you need anything girly or fabulous; bookmark this website. I'm in love with EVERYTHING they post. Like, want it all-NOW. They sent this large custom flower crown for Alfred and LC to share and also sent a mini flower crown in newborn size for little sissy. It's too adorable and I can't wait to photograph them in them together! The Golden Tot Shop has adorable boy things too, so if you're a boy-mom, don't fret! I love these ruffle wraps, floral wreaths and dream catchers, too! So, here's what you've been waiting for!!! 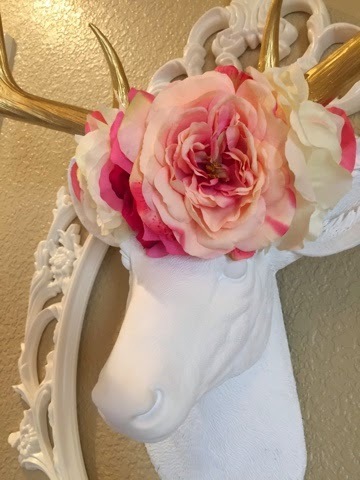 Near and Deer + The Golden Dot Shop are offering followers/readers a 14-point deer head and $15 shop credit! There will be TWO winners! There are several ways to enter, so follow the Rafflecopter entries below and don't forget to head to my instagram to get as many entries as you want! Giveaway will close on Saturday, April 11th at 12am and winner will be announced later that day! Also, use code LITTLELOVELIES for 15% off at Near & Deer and for 10% off at The Golden Tot Shop use code CROWN10!